Maitreya Bodhisattva is the future Buddha in Buddhist eschatology. 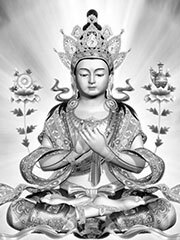 Maitreya is a bodhisattva who some Buddhists believe will eventually appear on earth, achieve complete enlightenment, and teach the pure dharma. Maitreya Bodhisattva will be the successor of the historic Sakyamuni Buddha. He is predicted to be a “world-ruler,” uniting those who he rules over. The prophecy of the arrival of Maitreya is accepted by the Theravada, Mahayana, and Vajrayana traditions. Maitreya is typically pictured seated, with both feet on the ground, indicating that he has not yet completed ascending his throne. He is dressed in the clothes of either a Bhiksu or Indian royalty. As a Bodhisattva, he would usually be standing, and dressed in jewels. Usually he wears a small stupa in his headdress, and could be holding a chakra wheel resting a lotus. A scarf is always tied around his waist. In the Greco-Buddhist art of Gandhara, in the first centuries AD in northern India, Maitreya is represented as a Central Asian or northern Indian nobleman, holding a water fial in his left hand. He is flanked by his two acolytes, Asanga and his brother, Vasubandhu. Maitreya resides in the Tusita heaven, said to be reachable through meditation, and which is considered to be much closer than the Pure Land of Amitabha Buddha. Sakyamuni Buddha also lived here before he was born into the world. Bodhisattvas live in the Tusita Heaven before they descend to the human realm as Buddhas. A bodhisattva may be thought of as an individual near to becoming Buddha. Because the Tusita heaven is still in the realm of desire, its beings still feel passions, but they require less to satisfy those passions, and are thus calmer and more refined beings. Maitreya’s coming coincides with a new school of teaching to surpass that of the original Gautama Buddha. Maitreya is predicted to attain Bodhi in seven days (which is the minimum period), by virtue of his many lives of preperation for Buddha-hood (similar to those reported in the Jataka stories of Shakyamuni Buddha). Maitreya’s coming is characterized by a number of physical events. The oceans are predicted to decrease in size, allowing Maitreya to traverse them freely. The event will also allow the unveiling of the “true” dharma to the people, in turn allowing the construction of a new world. The coming also signifies the end of the middle time in which humans currently reside (characterized as a low point of human existence between the Gautama Buddha and Maitreya). In order for the world to realize the coming of Maitreya, a number of conditions must be fulfilled. Gifts should be given to Buddhist monk, moral precepts must be followed, and offerings must be made at shrines. Maitreya, who is often represented seated on a throne Western-style, and venerated both in Mahayana and non-Mahayana Buddhism, is sometimes considered to have been influenced by the Zoroastrian Mithra. Some Zoroastrian ideas seem to have influenced the cult of Maitreya, such as «expectations of a heavenly helper, the need to opt for positive righteousness, the future millennium, and universal salvation», according to Paul Williams. In the Greco-Buddhist art of Gandhara, in the first centuries CE in northern India, Maitreya was the most popular figure to be represented, together with the Buddha Shakyamuni. In China, the cult of Maitreya seems to have developed earlier than that of Amithaba, as early as the 3rd century AD. Since his death, the Chinese monk Hotei has been popularly regarded as an incarnation of the bodhisattva Maitreya. His depiction as the Laughing Buddha continues to be very popular in East Asian culture. While a number of persons have proclaimed themselves to be Maitreya over the years following the Sakyamuni Buddha’s death, none have been officially recognized by the sangha and the Buddhist people. A particular difficulty faced by any would-be claimant to Maitreya’s title is the fact that the Buddha is considered to have made a number of fairly specific predictions regarding the circumstances that would occur prior to Maitreya’s coming- such as that the teachings of the Buddha would be completely forgotten, and all of the remaining relics of Shakyamuni Buddha would be gathered in Bodh Gaya and cremated. Since the growth of the theosophist movement in the 19th Century, non-Buddhist religious and spiritual movements have adopted the name and selected characteristics of Maitreya for teachers in their traditions. One of the best known of these movements is Share International, which equates Maitreya with the prophesied figures of multiple religious traditions, and claims that he is already present in the world.